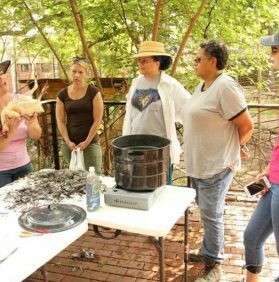 In April, SEEDS hosted a chicken processing workshop led by Durham County Cooperative Extension Agent Cheralyn Schmidt-Berry. Our two oldest hens – who lived happily here since they were just days-old chicks – were carefully and humanely harvested. With Cheralyn’s expertise and enthusiasm, the workshop was educational, thought-provoking and even fun! Many thanks to Cheralyn, Steve and Mark for making this possible, and for sharing our story! First https://celltrackingapps.com/track-stolen-phone-with-imei/ track imei up, a pretty sizable update for garageband for ios.